It seems a bit dada-esque but we’re featured in Brenda’s blog, the owner of Best Wedding Sites. 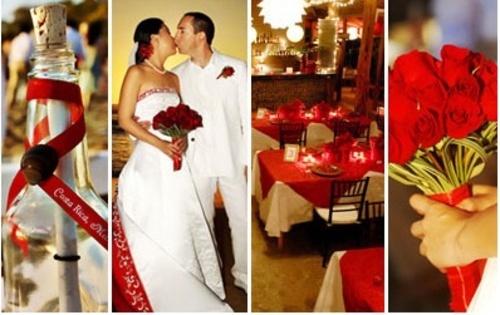 Judy and Erik’s wedding from March is featured, in all it’s red glory. I had an absolute blast working with Judy, who was a super cool bride and while not Lazy, she is an honorary Lazy Bride for her relaxed attitude (which made the wedding smooth as silk and a whole lot of fun for everyone). We went for a modern take on the traditional red for Chinese weddings, going with a monochromatic table top with vases covered in red silk dupoine-looking polyester (gave the same effect but for a fraction of the price), filled with red flowers (carnations- which look stunning when all grouped together, ginger, roses), red votives, red sheer organza overlays, red napkins and red chinese lanterns overhead. Mahogany Chevari chairs and rattan chargers added a counterpoint to all the red and kept the look natural with an Oriental feel. At the ceremony, we used white benches in the sand, which gave a communal vibe to the proceedings and added an unexpected twist from the usual chairs. The ‘message in a bottle’, which was the program, was a playful beach touch while the fans were a thoughtful gift that helped keep the guests cool on this warm day in the tropics. It was a great wedding with a wonderful couple and their guests. Congrats Judy and Erik!